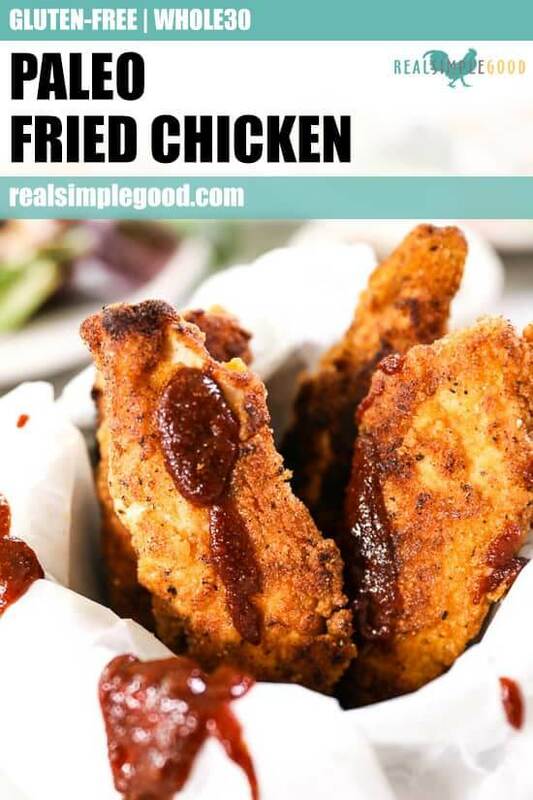 Looking for a Paleo fried chicken tenders recipe that is easy and actually gets crispy? 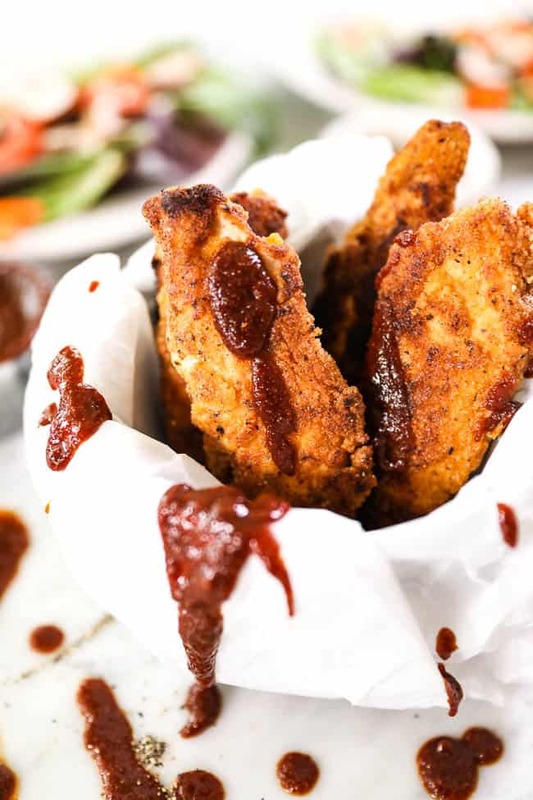 These fried chicken tenders are Gluten-Free + Whole30 and seasoned simply. 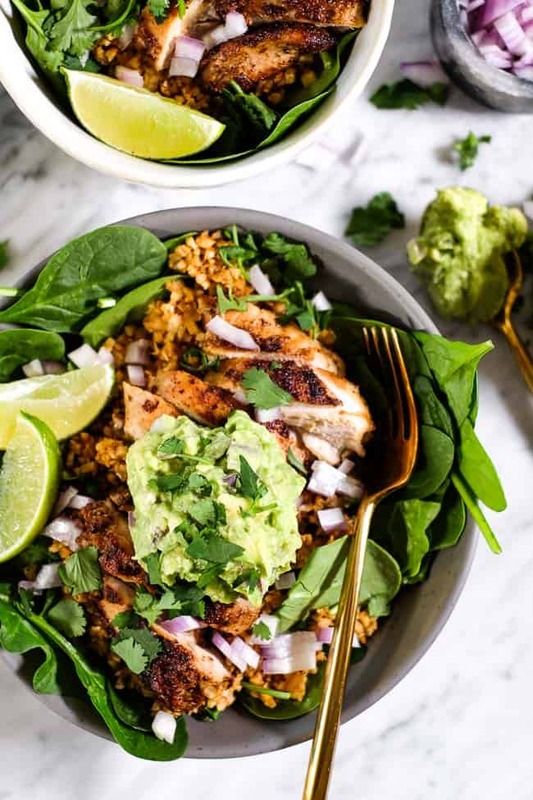 Pair them with your favorite sauce and side, and you’ll have the perfect family-friendly dinner! When we are baking and cooking with flours, we always end up grabbing Bob’s Red Mill. For this Paleo fried chicken, we went with a combination of their Almond, Coconut and Arrowroot flours. We’ve used Bob’s Red Mill products for years and have come to rely on them often for our grain-free flour needs! 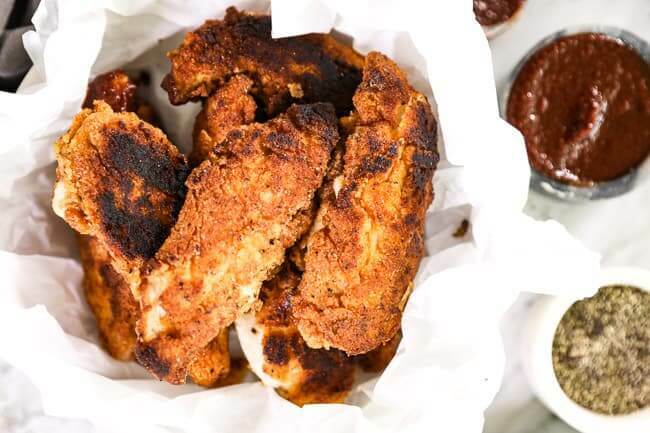 If you’re like me, sometimes you like to dive in and keep a recipe moving along, but you really want to let these Paleo fried chicken tenders cook undisturbed until they get golden brown before flipping. And then again on the second side, just let them get browned and crispy before removing. Another thing to note is that if you don’t use eggs to soak and then dredge the chicken tenders through the breading mixture, you will notice that the crispy bits fall off easier once cooked, but they are the most delicious bits to pick up and eat! 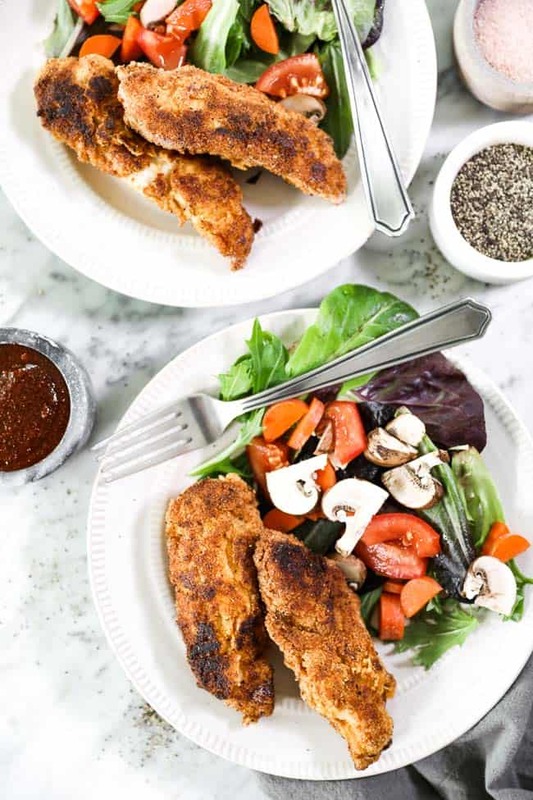 We used simple seasonings for this Paleo fried chicken, and it’s pretty perfect as is, not to mention super family-friendly. 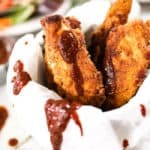 If you are someone who sometimes likes to kick things ups a notch though, you could add some cayenne to the mixture for a spicy fried chicken. You can also pick all your favorite sauces for dipping! We went with the BBQ sauce from our Slow Cooker BBQ Beef recipe! 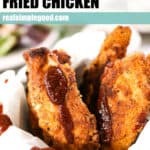 Whether you’re wanting to feed your family or just make some healthier comfort food, make these Paleo fried chicken tenders! Leave a comment below and let us know how it goes. Also, take a pic to share on Instagram. Tag us @realsimplegood, and give us a follow if you don’t already! We’d love to stay connected! 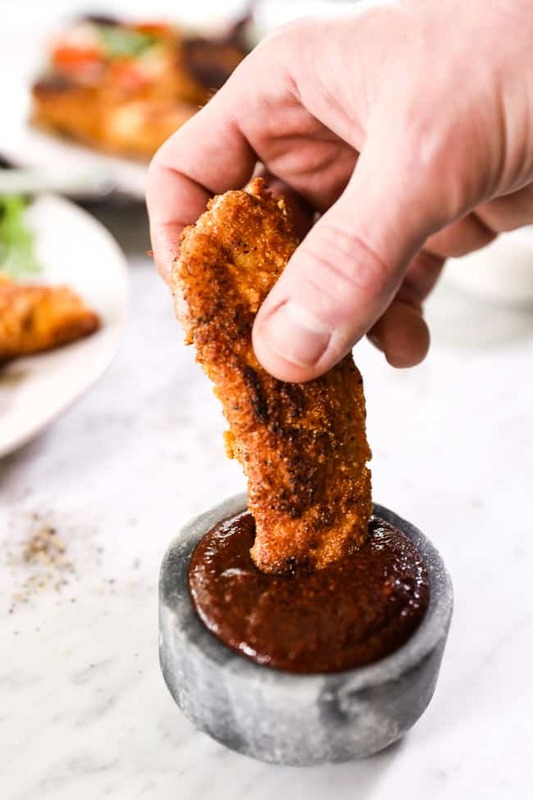 These Paleo fried chicken tenders are Gluten-Free + Whole30. 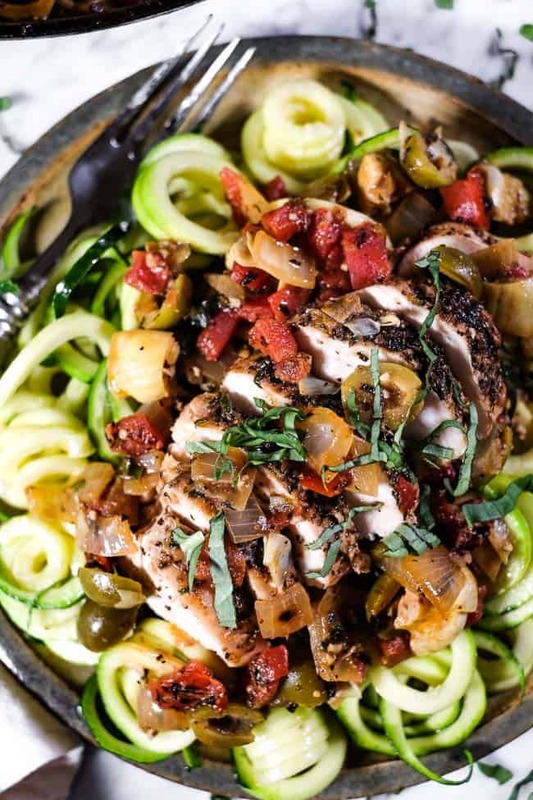 Paired with your favorite sauce and side, it’s the perfect family-friendly meal! 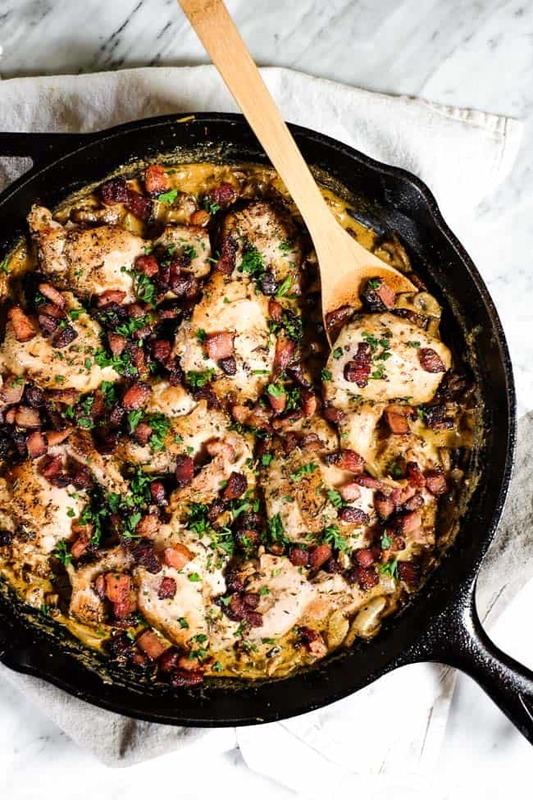 Enjoy comfort food made healthier! Place all of the dry ingredients into a shallow dish and whisk them together. Whisk eggs in a separate bowl. Dip the chicken in the eggs to coat, then into the flour mixture. 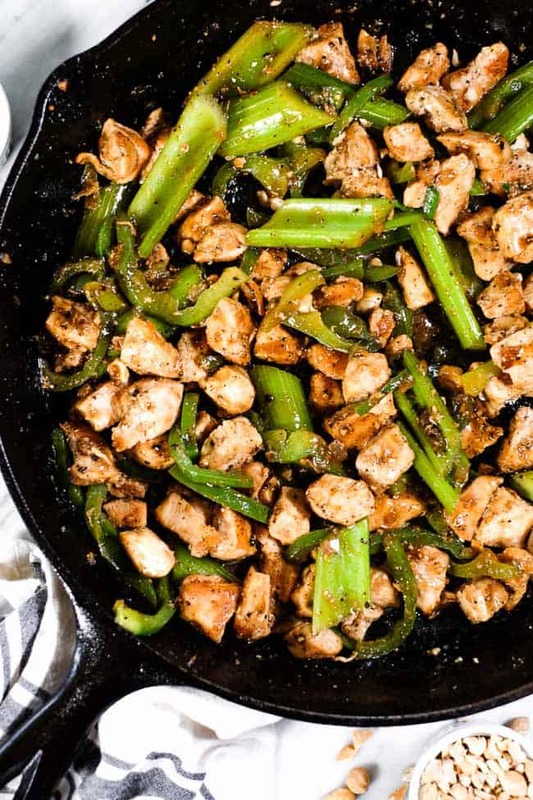 Place a large, high sided skillet (like a cast iron) over medium-high heat and add avocado oil. Once the oil is shimmering and hot, add in the chicken pieces. Cook, undisturbed for 3-4 minutes before flipping carefully using tongs (the chicken should be golden and crispy; timing may vary based on size). 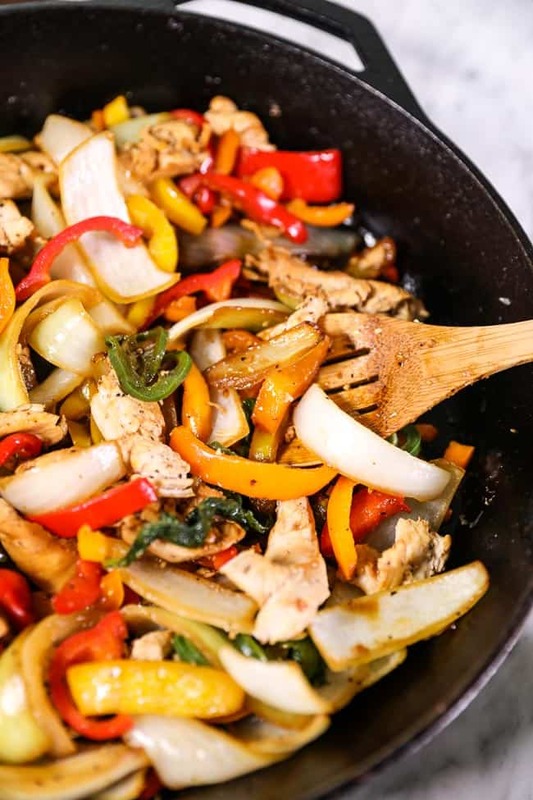 Cook for another 3-4 minutes, or until the juices run clear and the chicken is cooked through. 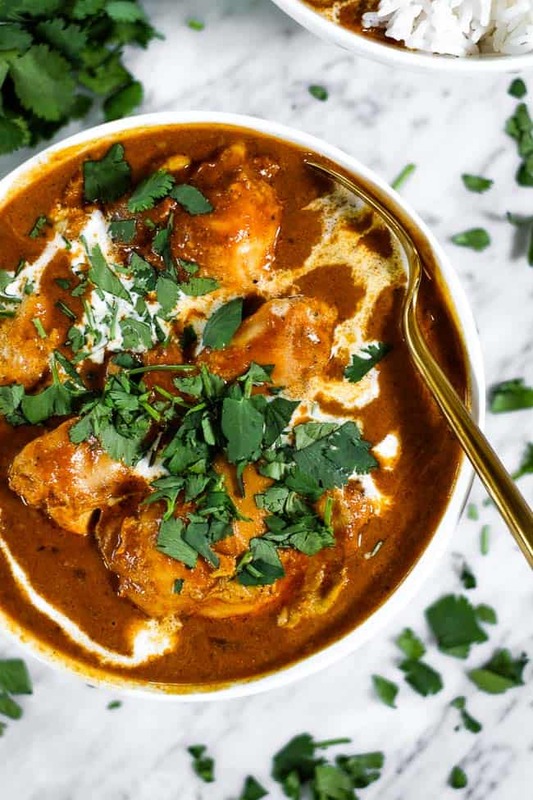 Serve with your favorite sauce and side dish and enjoy!